On the first Sunday in October, our church tried something different. We canceled regular worship services so we could go out into the community and be the church. While we church-goers know the point of our faith is to do God’s work, we tend to forget this central truth as we sit complacently in the pew. It’s easy to become a passive consumer or a critic of church theatre. It’s also easy to become disheartened, to despair at the enormity of the world’s problems. Our change in routine was intended as a reminder that we must be active in our faith, and that with God’s help, even the smallest of our good deeds is magnified. There were several projects to choose from: providing lunch for the homeless at a local shelter, renovating an elderly woman’s home, assembling kits for AIDS caregivers, decorating placemats for use in a prison ministry, and a music and fellowship program for nursing home residents. My family and I took part in the music program at the nursing home. I knew it would be rewarding because two of our most talented and versatile musicians were the headliners. They are the heart and soul of our monthly Bluegrass Night, an event that draws performers and their vintage instruments from all over Virginia. When we arrived, about fifteen residents had assembled, and the long, narrow room was already filled to capacity. I had envisioned a more spacious, less awkward setting that allowed for a larger audience and more freedom of movement for the musicians. Obviously, trying to be the church affords no guarantee of a cathedral-like work space. Our church that day recalled Christianity’s earliest era, when members met in cramped hidden rooms. The bluegrass duo kicked off the music with a couple of rousing old standards. I’d like to say that the audience was spirited and enthusiastic from the first bright banjo note, but this was not the case. A few residents smiled, some kept time with nods and light clapping, but the initial responses ranged from torpid to tepid. We invited requests, but the group remained inert. We had a wide range of musical talent available, so we pressed on. One of our younger members sang and played her guitar beautifully. Another offered two lovely flute selections. A lively original song by one of the bluegrass pair was well received. With each successive performance, the crowd became more visibly appreciative. A burst of energy accompanied the unexpected arrival of one of our youth, bearing both guitar and cello. When her mother sang a moving a cappella version of In the Garden, we reached a turning point. A frail, pencil-thin man knew every word. He sang along and moved his hands gracefully as though directing the choir. Everyone joined in on the chorus. The audience had finally warmed up, and the group had achieved a sort of unity. The differences between residents and volunteers, so striking at first, were less apparent. When our bluegrass veteran offered an old Gene Autry favorite, a tiny quiet lady in a wheelchair burst to life. As she sang heartily, eyes closed, head back, we could sense the warm rush of memories that swirled around her. My daughter and I had planned to play a few violin and piano duets. As we arrived, I realized with dismay that I had left my hymnal on the kitchen table. While D has the gift of playing by ear, I do not. 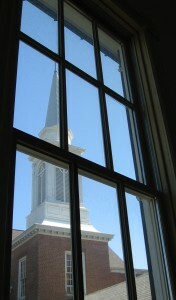 My husband made our performance possible; he jumped in the car to locate a United Methodist church and borrow a hymnal. We were in an unfamiliar area, but he was successful, as I knew he would be. By the time he returned, the division between performers and audience had decreased further. Our group had become a pleasant circle of fellowship. The piano was out of tune, but I played softly and minimized the notes so that D could carry the melody. I was especially glad to be her mother that day. Most people would agree that music is a powerful connector. But given the opportunity, it’s also a vital conduit for the Holy Spirit. That Sunday morning, it was not just the music that drew us together in ways that words alone cannot. God was with us, just as he was in those early house-churches of the first century. With His help, we took some baby steps in our quest to be the church. We didn’t end war, illness and poverty, but we brightened up a little corner of our world. The music carried the breath of God’s presence, immediate, dynamic, and enduring.